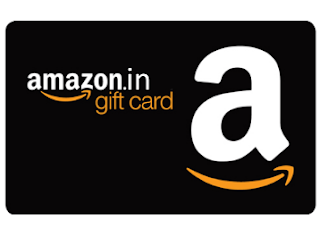 Amazon – Get 10% Cashback on “First Time” Purchase of Amazon Email Gift Card (Max Cashback is Rs 100). Amazon has come up with awesome deal where you will get the 10% Cashback (upto Rs 100) on First time Purchase of Amazon Gift Cards. Offer is valid from 22th October, 2017 to 29th October, 2017. Please Check the Eligible Criteria before using this Offer !! 6) You will get the 10% Cashback (upto Rs 100) in your Amazon Pay balance within 10 working days. i) Get 10% cashback as Amazon Pay balance on purchase of Amazon Email Gift Cards. ii) Max cashback per customer is Rs 100 worth Amazon Pay balance. iii) The offer is valid only on your first Amazon Gift Card purchase. iv) Offer Duration: October 22nd, 2017 to October 29th, 2017.
v) Cashback as Amazon Pay balance will be credited within 10 days of your Gift Card purchase. ii) The offer is applicable ONLY on your first Amazon Gift Card purchase.